My older multi-function hub had suddenly stopped working, and I found this 3-in-1 to be a capable alternative. 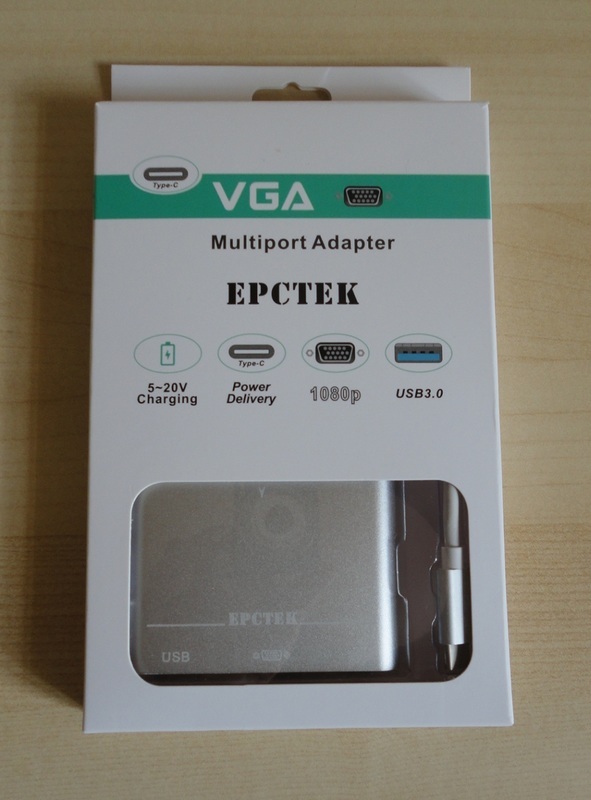 Connection from smaller devices like phones and tablets (and increasingly laptops) can be expanded with an adapter like this one with a USB Type C plug at one end and a choice of three input ports that can actually be used together (a big advantage of this type of adapter). The three options are a VGA port, a standard (full size or Type A) USB 3.0 port and a USB Type C for charging purposes only. 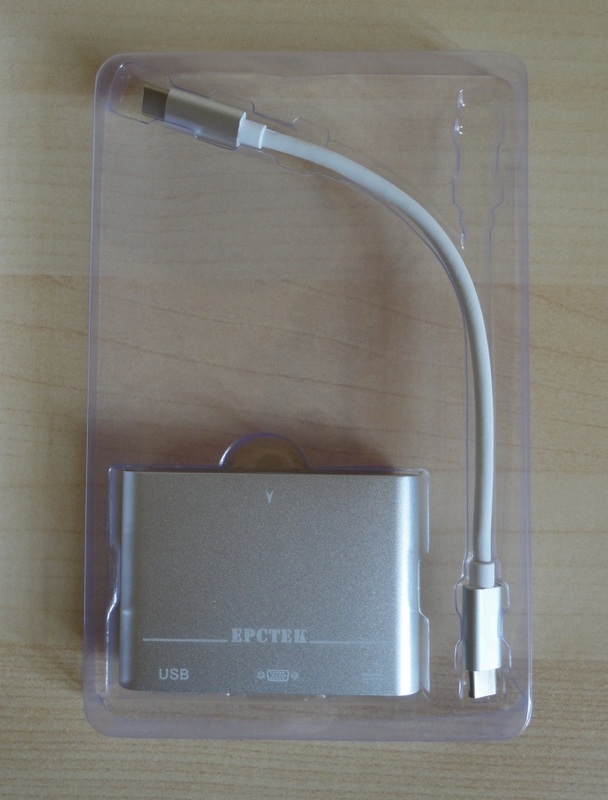 A short (18 cm or 7 ½ inches) USB Type C cable is also included. I needed a way to connect a portable projector to my tablet to display video and, with this adapter, I can do that while at the same time accessing the contents of a USB flash drive while the tablet charges. 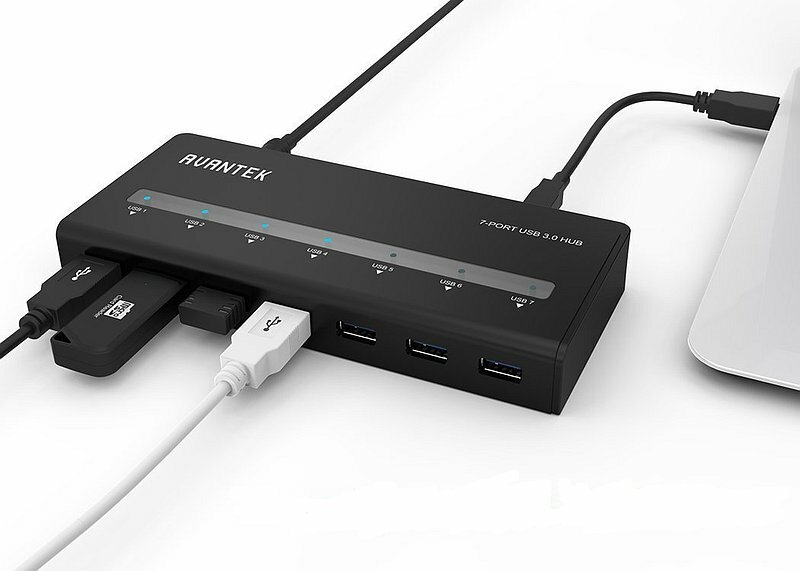 There are other permutations, depending on your devices and requirements, like connecting to a multiple USB hub, but generally the USB-C to USB-A option is invaluable to connect a wired mouse or keyboard, or a flash drive to a device that lacks the standard size USB port. 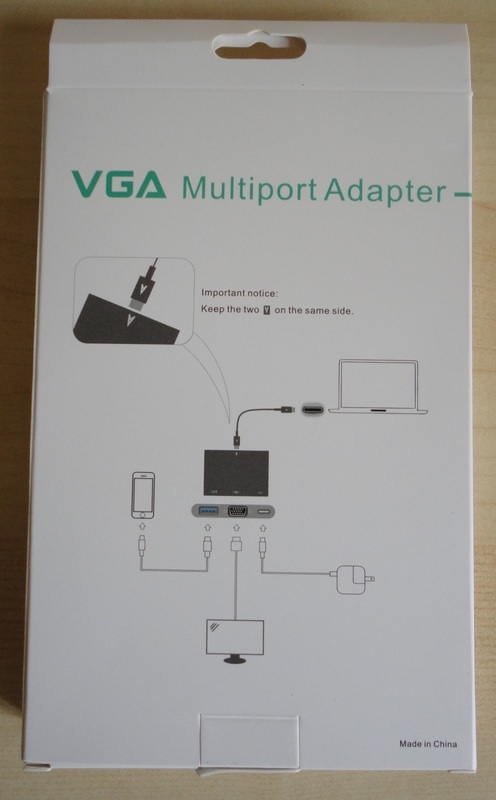 The VGA port is also very useful to connect a screen, monitor or projector. The adapter delivers impressive speeds of transfer, has a sleek aluminium look and offers retro-compatibility with USB 2.0 standards. Being old-fashioned, I'm not keen on cloud storage, so when I'm on the go, I love the ability to transfer or back up bulky video and photos from a camera or phone to a collection of USB flash drives that I carry around with me. A very useful multi-function adapter that works impeccably and has fully met my expectations. A computer can never have too many USB ports, especially if it's a laptop, or if they are hidden away at the back of a tower. My new laptop has three ports (one is a 3.0), but access is not exactly convenient. USB hubs offer an easy solution, particularly 3.0 hubs with their fast transfer speeds. 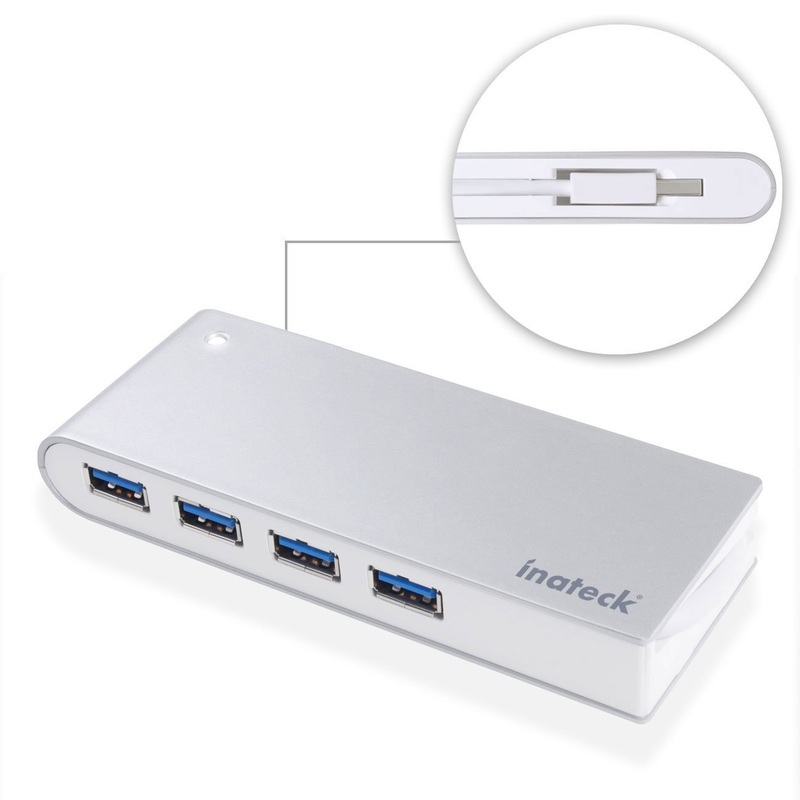 This Inateck 4-port is an excellent choice. It is solid and well-made, and looks smart. The very short lead is designed to tuck neatly out of sight inside the body of the device and, while in use, it makes the four ports easily and safely accessible with no danger of getting tangled up in a length of cable. Depending on your workspace, this small device can sit permanently on your desktop. All four ports are of the 3.0 variety, and in my tests, the speed of transfer is significantly faster than with the older 2.0 protocol (four to eight times faster). It is retro-compatible with older USB ports and works with 2.0 devices and even 1.1. In the video, I was copying to a very old USB flash drive of the 2.0 type, so the speed was slower than with current devices. I like the fact that it has surcharge protection. If your computer is a desk-top tower type, a 3.0 extension cable is available (but not included). In my opinion, it is a quality accessory that fully justifies the very reasonable price and compares favourably to other similar units. This USB hub is a little different from my other ones. For a start, it has seven ports, all of the 3.0 type. It effectively turns a single 3.0 hub into seven, with the superior speed of the 3.0 standard (the blue connectors indicate a 3.0 device). It draws power from the mains instead of using the computer's phantom power; this gives it excellent stability and the juice to perform to a high standard. It is also equipped with individual light indicators for each port. Like my other hubs, it needs no drivers and works instantly with all the devices I have tested it with (laptop with Win 8.1, older desktop with Vista, Kindle Fire HD, several USB flash drives, optical mouse, Sony compact camera, Nikon DSLR camera, music players, and a WD external hard drive). Transfer speeds very but, in general, this hub really delivers on the speed front. I noticed no difference whether the device was plugged into the hub, or directly into the 3.0 USB port on my laptop. The surge protection feature gives peace of mind. Physically, the hub is a slim, lightweight black box, with all seven ports lined up on the anterior long side, and the USB and power input ports on the rear. It comes complete with a 3.0 USB cable (about a metre long, but I have a USB 3.0 extension cable, giving great placement flexibility), and the power adapter (5V/2.5A). Like other 3.0 USB hubs, it is retro-compatible, so it will work with 2.0 hubs and even 1.1, but at vastly reduced speeds. In theory, you could use this hub as a charger by simply plugging the power adapter into a wall outlet but, as I understand it, when also connected to a computer via the USB lead, charging happens in Smart Mode, which is always preferable for speed and efficiency. Of course, the USB connection is essential when transferring data, such as photos and video from a camera, or any kind of data between the computer and peripherals and, at this point, the limitations are more to do with the computer than the hub. I am really impressed with the build quality and performance. It offers capabilities which I didn't have before. In my opinion, it is a top quality device that fully justifies the very reasonable price. 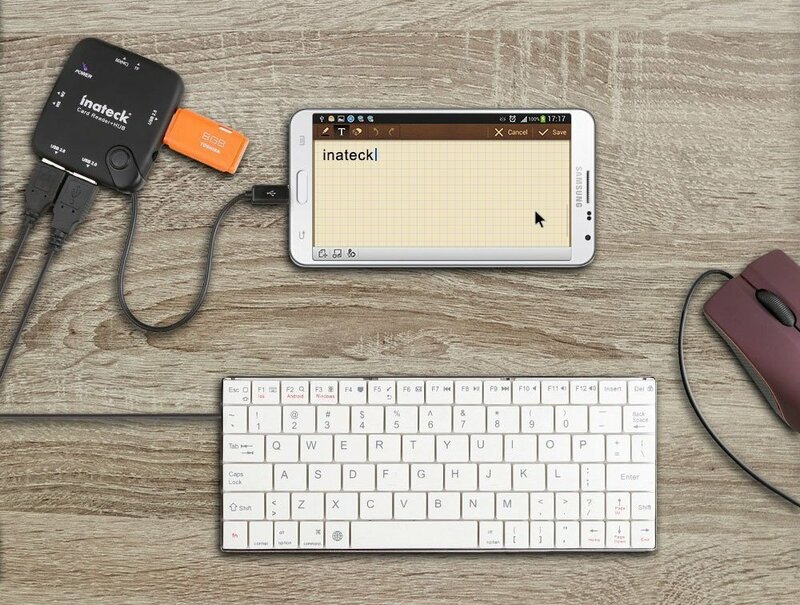 This is a wonderful little gadget that can connect a variety of devices in endless configurations. Physically, it is a small square black box, approximately as wide as a credit card, with a built-in micro-B connecting cable and a separate USB cable. 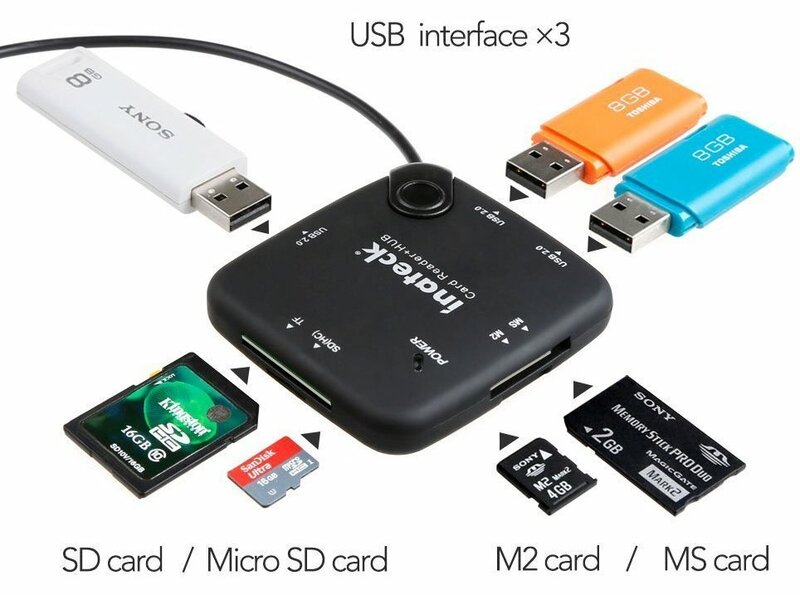 It has 3 USB 2.0 ports as well as reading slots for a variety of memory cards. Truly portable and versatile. Since I was asked to fully test and review it, I have used it to download photos and video from my Sony Cybershot and Nikon D3200, directly from the memory cards to a USB flash drive, which is brilliant when you are on the go and don't have a laptop handy. My friend's smartphone (you need OTG-compatible devices) became a mini-workstation when we connected it to a keyboard and wireless mouse via the USB ports. We even successfully downloaded video from the Nikon to a portable hard drive using the USB connections and taking power from a portable power bank via the supplied USB cable. Another neat application is to view a movie on a tablet from a USB flash drive without having to download the video to the tablet. Very happy with the reliable performance and speed of transfer. It's unusual to find such a range of options in one small device, but this card reader/hub seems to do it all with ease and in style. Ideal travelling companion and problem-solver. UPDATE: I'm sorry to report that the reader has stopped working. All three USB ports are flagged as damaged when I try to connect to a laptop and basically nothing functions. Major unit failure after only 14 months of moderate, careful use. A great pity!